Ali at VeryBerryHandmade has a fabulous competition going on right now. Blog about your 2012 resolutions linking back to her "Resolutions to Sew 2012" post which you can find here, leave a comment on her post to say you have done so and stand a chance of winning one of many fabulous fabric prizes. I don't really make many resolutions, but I have been thinking quite a lot about what I want to do this year. Firstly, I really need to finish some of the things I started last year in the Rainbow Scrap Challenge. I hate having unfinished projects, they stop me thinking creatively about what I want to do next. So, they have to go. This is one of the tops I finished that needs quilting and binding. Secondly, I want to do more with designing my own quilts, rather than using published patterns. I've got lots of ideas swimming about in my head, but the UFOs are slowing me down as is a lack of confidence. Because I'm not certain about my ability to work out a design for myself I keep falling back on some of the wonderful patterns designed by other people. This was a little quilt that I designed earlier this year, and I was rather pleased with it. I may not have mentioned that I've started a City and Guilds course in Patchwork and Quilting, which I'm very much enjoying. So I need to keep on top of the work I'm doing there, and get on with the assignments. And finally, though it's nothing to do with sewing, I want to do more writing. Last year I did a short course with the Open University on Creative Writing, something I haven't done since I was at school, and discovered that I really enjoy writing short stories. I've joined a local writing group now and had one story accepted for a local free magazine, so I hope to do more. The other thing you have to do for Ali's giveaway is to pick which of the fabulous fabric prizes you would like to win the most. 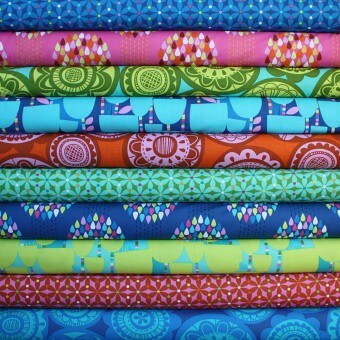 I'm probably going to pick this wonderful bundle of Erin McMorris fabrics from Backstitch, though there's several others I like just as much. That little chick is so cute. It will make a very good little quilt for spring. It is good that you have the ability to draw. That is not a strong point for me. Good luck on your goals. I joined JudyL at Patchwork Times in her UFO challenge 2012. I'm going to give it a good try and hope to have 12 finishes by the end of the year. I hope you win some fabric. Some excellent goals, especially the creative writing one, how exciting. I remember when you had no ufo's , it's not bad too have some, the more our skills and creativity have improved the more we want to do! I love the bird quilt, I really admire those who design their own quilts! I really love the one you designed, Amanda! It's colorful and whimsical and just plain wonderful!